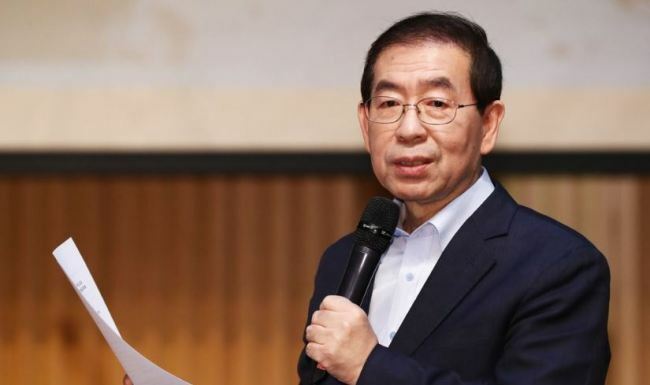 Seoul Mayor Park Won-soon plans to visit Beijing this week to attend a series of events on partnerships between the capital cities, his office said Sunday. He plans to begin a four-day trip there through Wednesday as the cities mark the 25th anniversary of forging sisterhood ties. Park is scheduled to visit a pavilion, named the Live Seoul Play Ground in Beijing, to publicize tourist spots in Seoul on Sunday afternoon. He will attend a forum on climate and air pollution on Monday and deliver a special lecture at Peking University. He is to become the first Seoul mayor to lecture at the school. On Tuesday, he will preside over a meeting of heads of provincial governments in South Korea and China on ways to strengthen bilateral partnerships. He will be accompanied by representatives from South Korea's small and medium-sized businesses and startups on the trip.